Catcher Misc Tips is written because not all skills fit into a neat little package, however are incredibly important to know and learn. 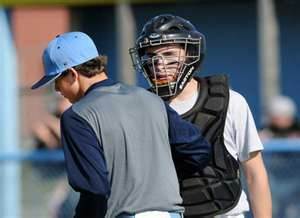 Catcher Coverage Responsibilities: As if the catcher didn’t have enough responsibility, he also has duties to cover other bases in addition to home plate, and you very well may be surprised how many people don’t know that. The television cameras never show what the catcher does after the ball is hit unless there’s a play at third involving the catcher and runner and people are more concerned about the results of the play, never questioning where did the catcher come from. 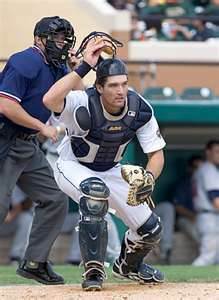 Any time the bases are empty, regardless of the number of outs, the catcher is required to back up first base on any ground balls hit to the infield, in case there is an errant throw the first baseman can not cleanly field, the catcher can keep the runner from advancing to second base by fielding the ball. You are not in a race with the batter, so sprinting to first base as if you were trying to beat the hit out, is not required. When the batter hits the ball, you run down the fence or out of bounds line to first base, keeping in mind the angle the ball will come depending on who is throwing the ball. "See Right Fielder Going To Backup"
In other words, you wouldn’t have to run as far down the line if the second baseman is throwing the ball, because the angle he’d be throwing from would have the ball wild directly across the base or angled towards home plate. On the other hand a throw from the third baseman requires you run as far as possible, as quickly as possible, because the angle he’s throwing from would shoot the ball down the right field fence, which is why the second baseman and right fielder are also required to back up first base in this situation. Improve Your Swing? Check This Out. Runner on First Base: It’s important you analyze the runner on first base and have an educated guess as to how fast he is, because you are still responsible for backing up first base even with a runner on first, but you don’t run as far down the line and you must be prepared to return to home plate should the runner, for whatever reasons, appears to have ideas of trying to score. 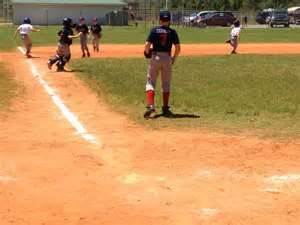 With a runner on second, or second and third, the catcher stays parked at home plate in case there’s a play there created by a runner trying to score. "Involved In Covering Third Base"
You will encounter situations, especially in close ball games or an expected pitchers’ duel, even in the early innings of the game, where the opposition will want to bunt the runner on first base over to second, in order to get a runner in scoring position. (5.) 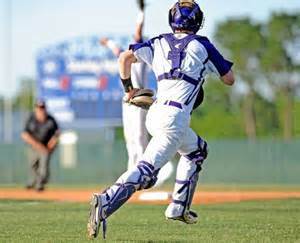 If the ball is bunted towards the third baseman and he is charging in to field the ball, the catcher must give orders of where the fielder is to go with the ball, while running to third base in order to cover the base if the runner tries to advance from second. Why the catcher? 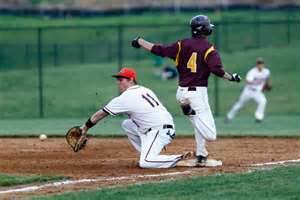 "Slowing The Tempo of the Game"
Should the third baseman be forced to field the ball, he’ll be out of position to cover third, and the shortstop will be covering second base, leaving only the catcher to cover third preventing the runner from advancing to an undefended base. Depending on the coach’s philosophy and probably age level, instead of the catcher, the pitcher can be assigned to cover third base in this scenario, but that’s not normal due to the risk of a possible injury if there’s a collision at third. Guess they figure the catcher is tougher … and they’re right. All baseball games develop a tempo, a speed the action takes place, for instance a 0-0 pitchers’ battle, where both sides are retired 1,2,3 the tempo is fast, where a 26-3 score drags because of the long innings and lack of competition. For the most part the catcher goes along with the tempo of the game as just another player, but there are times a catcher must take it upon himself to change or control the tempo of the game. This scenario develops when the pitcher requires an attitude adjustment, and I don’t mean a slap up side the head, I mean a tempo attitude adjustment. If the pitcher is in the groove, painting the zone no matter where you set up the target, you want to continue a fast tempo. Give the signs, set up, catch the ball, throw it right back to the pitcher and give the next sign. The pitcher knows when he’s on and all he wants is to throw the baseball, so get it back to him as soon as possible and get ready for the next pitch. However, there are other times the pitcher wants the ball back in a hurry, eager to throw because he’s having trouble finding the strike zone, and the more he misses, the more frustrated he becomes and the quicker he wants the ball back to try again. "Quickly Getting Out Of The Box"
This is the time you want to slow the tempo of the game down forcing the pitcher to pause between pitches, and this can be accomplished in a number of different ways. (1.) Call time out, go to the mound and calm the pitcher down. (2.) Should that fail to slow him down, take extra time before giving him the signals. (3.) Stand between each pitch which requires longer to get into your catching position.